Known colloquially as "the German eco-label", the Blue Angel (in German: Blauer Engel) has been awarded since 1978 to the top 20-30% of environmental performers in various categories (e.g. household appliances, automobiles). Intriguingly, the German tourism fleet (i.e. the passenger ferries doing coastal trading) is also a category for the Blue Angel label. Naturally, Germany's most prominent LNG ferry, the MS HELGOLAND, was a chief candidate as being an extremely low environmental impact mode of transportation. All of that hard work by ferry company Cassen Eils finally paid off this year, as the government finally decided to issue the Blue Angel the MS HELGOLAND. 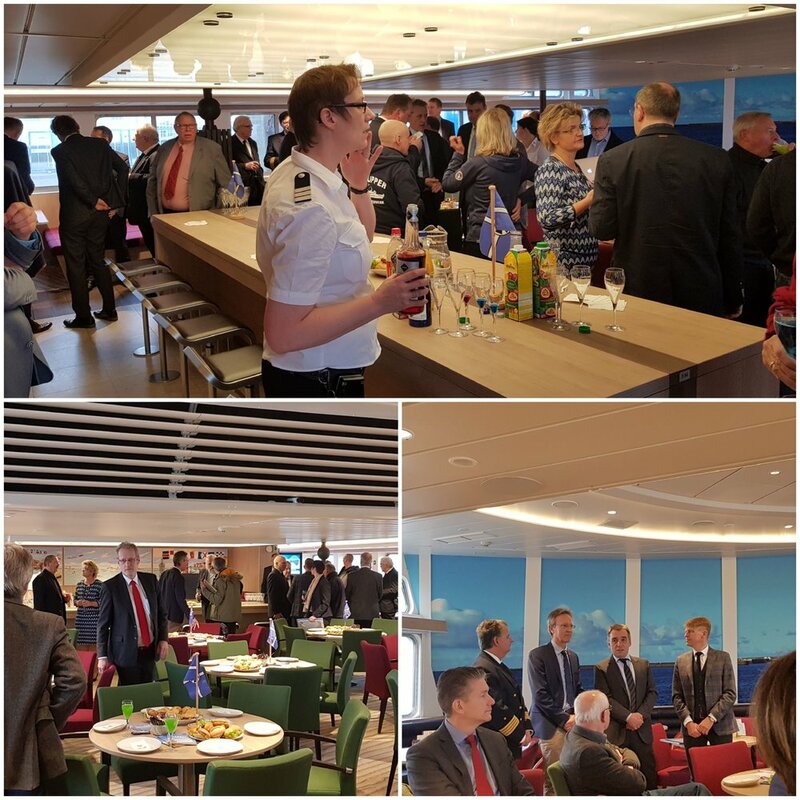 The award event took place on March 16, 2018 on board the MS HELGOLAND with numerous dignitaries attending. 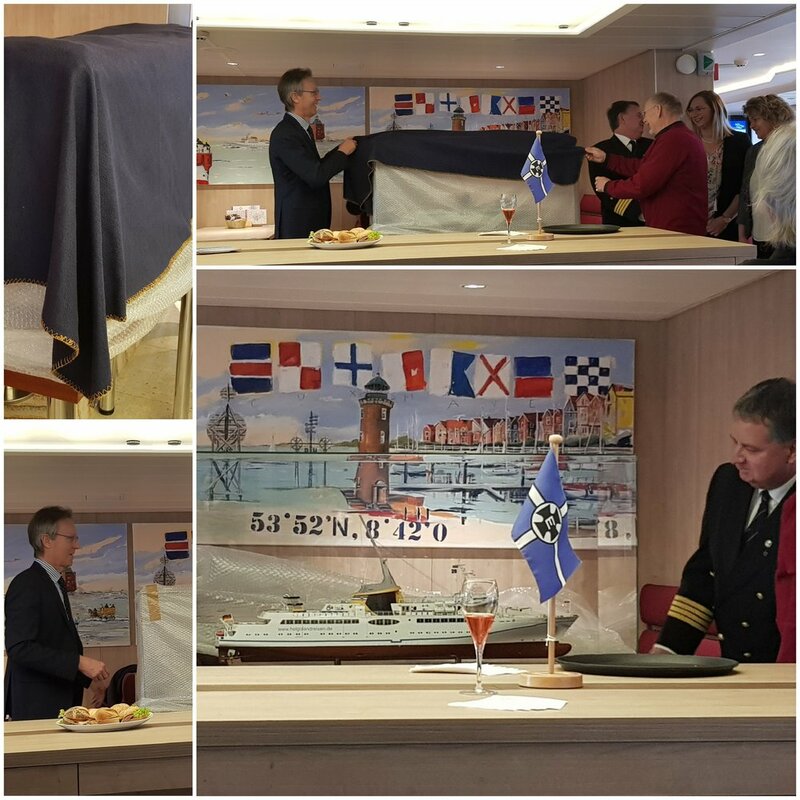 The most stirring part was when long-time Cassen Eils Captain Ewald Bebber, who has a private, complete model fleet of all Cassen Eils ships, was presented by company management with a "permanent loan" model of the MS HELGOLAND, the ship he regularly captains. The attendees sitting at my table agreed that, unlike a lot of companies nowadays, if you give a lot to Cassen Eils, you get a lot back. I could not agree more - it's a great team. We all had been a bit stumped by the covered box in the middle of the room. I would be lying if I didn't admit that I was quite delighted when this mystery was finally revealed! Following the speeches, the group moved out on deck, where the Blue Angel emblem, painted on the vessel, was revealed to the attending press to much celebratory fanfare. The wind was intense, and I half expected a few cameras to get blown into the ocean. Luck was a lady, though, and no cameras were harmed. After all this we had the pleasure of touring the engine room of the MS HELGOLAND, where the LNG power plants are located. The engine room was extremely orderly. Clearly, a lot of care goes into maintenance. I remember when the ferry was just a bare hull -- it's come a long way since then! Now, you can even walk around without a hard hat. And there are man-sized fire extinguishers. I love maritime law -- ships are incredibly cool, and it's a privilege to get to be a part of all this. More than 550,000 guests have been carried by the MS HELGOLAND since it launched. We're sure this is just the very beginning of this exceedingly fine ship's magnificent story.